The Book Room Optical Illusion was randomly uploaded to the site. 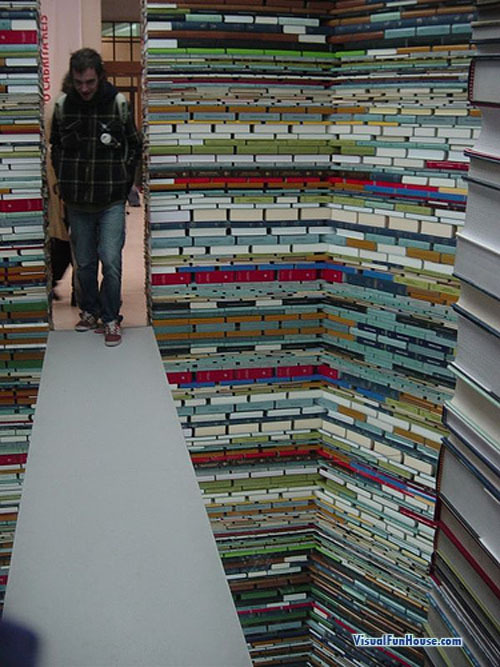 This picture is of a walk way through a bottomless pit made completely out of books! Would someone really make this tunnel of books or is there something that I am missing here? If he steps to the side is he going to fall to his death? Or is there something of an illusion going on here.. what do you guys think? It is a mirrored floor. You can see the line right through the middle of the floor on the right of the picture. It really was fairly obvious, though very well done. If you look at the books on the same level as the floor, you see they repeat, and I doubt anybody would make a bottomless pit that neat. Well, nobody’s noticed so far that the ceiling must also be mirrored, so the entire thing wasn’t spoiled. Until now. It has a mirror on the bottom and a pile of books on top of it. It’s simple.